Card Text Play: Deal 4 to a creature that is not on a flank with 2 splash. 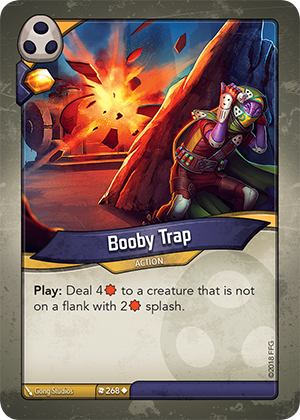 Does Booby Trap deal damage simultaneously to all affected creatures? Yes. If multiple creatures are damaged by a single effect, that damage is dealt simultaneously. Therefore, all damage dealt from Booby Trap is dealt simultaneously. “Splash” means the creatures to the left and right of the target will receive splash damage as indicated by the card – in this case, it’s 2.